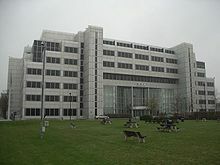 It is reported that the BBC's White City headquarters, built in 1990 by Scott Brownrigg and Turner, is to be sold along with TV Centre. "We have begun to talk to prospective purchasers but we're at a very early stage and we're nowhere near a shortlist let alone a preferred bidder." Ariel confirmed the sale with: "White City will be emptied out and sold"